Here’s another one from the movies-you-may-not-know pile. Pleasantville is a pretty strange film in concept, two teenagers (twins in fact) get sucked into a black and white 50s TV show thanks to a slightly creepy TV repair guy. Their behaviour in “Pleasantville” begins to affect the town and its people so much that the very nature of their society is completely and irrevocably changed. It almost sounds like a kids film, until you watch it and realise there’s some definitely not-for-kids themes going on. The best thing about this film is it’s use of colour. At first, everything in Pleasantville is black and white, but every time someone removes themself from the normal pattern of events colour appears in the town. 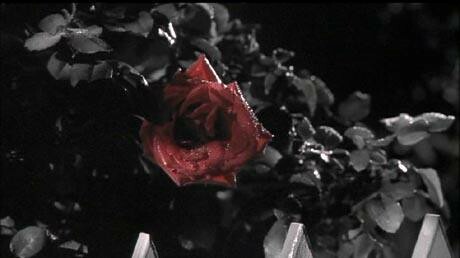 The first to change is a red rose, with colour then spreading to cars, trees and finally, people. The town ends up divided between the orthodox residents, who remain monochrome, and those who have given in to the looser morals and free thinking of our invading characters, who stand out in glorious Technicolor. What results is an unexpected comment on racism, morality, culture and the nature of society. There are some great funny moments in the film and the appearance of “Greasers” and other bits of 50’s memorabilia really highlights the contrast between the two sides of society, and marks the shift in ideas between the 50s and 60s. It would be easy for this film to play on the generation gap, having all the kids in colour and adults as the prudes, but the side story of the growing romance between David’s “mother” and the ice cream parlour owner (Jeff Daniels) is equally, if not more compelling than the main plot. Daniels’ character’s discovery of Art is also a really nice moment, well performed by an underrated actor. I definitely would recommend Pleasantville, as both a nostalgic look back at our romanticised view of 50s america and as a film which actually manages to make some valid points. As I said, the ending isn’t great, and does leave a bit of a plot hole, but I’ll forgive it that on the basis that the rest of the film is really worth your time. I don’t know why I remember this, but the day it came out, the headline of its review in my local paper said “The New Oz”. I don’t know that I’d necessarily go that far, but I agree with your review and believe it to be a truly under appreciated flick. I especially love how slow the transition is from black and white to colour. Sure things like the rose, or the bubblegum are easy targets, but subtle touches like the clock on the wall, or the cover of a book give the transformation of these characters world a bit more grace. Great piece! Might have to dust off my DVD and give it another watch tonight! I really like Pleasantville – a simple idea, intelligently executed… and, my gosh, a Hollywood film that celebrates female sexuality. Great stuff. re. “The New Oz”: I presume they mean ‘The Wizard of… ‘ and not the HBO one about the prison? he he I can kind of see the Wizard of Oz connection, its the onyl other film I can think of which makes such a big deal out of a colour transition! Mad Hatter is right thought that the subtlety of the transition is brilliant, so that the background gradually becomes more colourful. I watched Pleasantville maybe 7, 8 years ago. I remember the general flow of things; recently been considering revisiting it after running across it several times in various film threads. Do you feel it’s worth multiple/additional views? Also, could you share your version of the ending for those of us who’ve seen the flick (with spoiler tags, of course)? I’ve had Park Chan-wook on my mind lately. There’s a version of his Lady Vengeance floating around out there that also makes excellent, if very simple use of color manipulation. Yes the use of colour is brilliant and far better executed than simplistic way they did it in Oz. Another film that uses the transition between colour and b&w really well is Memento. In that film it isn’t integral to the plot the way it is here but it helps the structure of the film work. I definitely think its worth a second, third, fourth watch! What I didnt like about the ending was that it makes no sense for Jenny to stay in Pleasantville because its a place that doesn’t exist! And when David returns, does that mean she never existed in the “real” world or does his mother just not care that she’s vanished? I figure that pretty much sums up the main message of the film in one pretty neat scene. But, hey, no one’s paying me to write screenplay’s! Andy: I really really need to see Memento. I will get there one day. Aw, man! That’s pretty ingenious. You should be a script doctor, haha. You haven’t seen Memento! Go see it now, a seminal movie of the decade. What I love about “Pleasantville” — definitely the underrated gem you say it is — is the way it works on so many levels: solid acting (William H. Macy AND Joan Allen in the same movie? Come on! ); really poignant characters; stunning visuals, use of colors and cinematography; serious themes thinly veiled within the plot. This is sort of a strange movie, and there are parts that don’t fit (i.e., the end), but I like that it’s fun to watch and fun to look at. That’s a rare combo these days.